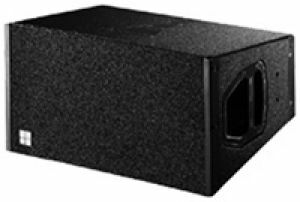 The Q10 LOUDSPEAKER is a 110° x 40° passive 2-way loudspeaker housing two 10″ LF drivers and a 1.3″ HF compression driver with a rotatable constant directivity horn and a passive crossover network. The two 10″ neodymium LF drivers are positioned in a dipolar arrangement providing exceptional vertical dispersion control with the nominal angle being maintained down to 400 Hz. The Q10 can be used as a stand-alone full range system or in combinations with other Q-Series cabinets ground stacked, or mounted on a high stand with the Q Flying bracket. When used in the upright configuration it has a very accurate 110° horizontal constant directivity behaviour that is maintained down to approximately 800 Hz. Its wide constant directivity performance provides remarkable transparency when used in close proximity to listeners. It is also ideally suited to ambient and /or distributed sound reinforcement tasks where orientation within the sound field is critical. The Q10 cabinet is constructed from marine plywood and has an impact resistant paint finish. The front of the loudspeaker cabinet is protected by a rigid metal grill, covered with a replaceable acoustically transparent foam.